Are you ready for an excursion in nature while on holiday that will make you feel like a local and that you won´t ever forget? 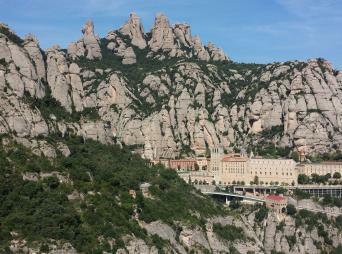 Take a ride to Montserrat, enjoy the national park with its stunning views and visit the sanctuary of the magic mountain! After this amazing and unique experience, you will take a ride to the Oller de Mas Celler, a famous winery in a tenth Century castle surrounded by gorgeous vineyards with jaw dropping views. With your guide, spend time exploring the vineyards, touring the production plant and the cellar to learn about the wine making process. Feel the past and discover the exciting countryside of Catalonia in this intense experience of nature, that you can share with your new Spanish friends! What to wear comfortable clothing and shoes. A bottle of water in summer, as it gets hot and humid. Wet weather gear if rain is expected. Additional Info:: tour takes place rain or sunshine. Please note that the company reserves the right to extend this limit to 18 people should it be exceptionally necessary.